It might seem like good fun for kids to toss in crumpled up newspaper, paper airplanes or other garbage to burn in the fireplace, but it's best to limit your fire to wood only. Excess material, particularly garbage, can cause smoke to build up, which can leak back into your home and become a health concern. Most kids understand that they should never approach a fire too close or use their hands to touch anything nearby, but that may not stop them from wanting to help stoke the flames. If you feel that your kids are responsible enough, demonstrate how to use fireplace tools and then carefully help your little ones do it themselves. Kids tend to get a thrill out of seeing a large, roaring fire, but under no circumstances should you use liquid lighter fluid to start your flame. This fuel can cause the fire to spread beyond the safe confines of your fireplace grate. Additionally, a fire that's too large can cause damage to your fireplace in the form of cracks and creosote buildup. 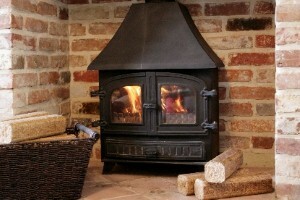 Smaller fires are much safer and easier to manage.